A great corporate learning program. Pre-IPO. Comprehensive health care for you and your family. An unbelievable office in the heart of downtown San Francisco (or in one of 18 other locations worldwide). Not to mention a $2,000 per year travel stipend for you to take a trip and stay at an Airbnb anywhere globally. Oh yeah, and the 2016 #1 Best Place to Work and holder of the #2 spot on Paysa’s CompanyRank. No wonder working at Airbnb is a bucket list goal for top tech talent. Airbnb CompanyRank score over five years, per Paysa data. Airbnb jobs aren’t necessarily hard to find (the company has experienced nothing short of tremendous growth over the last few years), but that doesn’t mean getting hired is a walk in the park. In fact, while welcoming and accommodating to all candidates who are talented enough to score an interview, Airbnb jobs are notoriously tough to land. Lucky for you, this guide walks you through everything you should expect in your Airbnb interview process. You’ll walk away from this post with an idea of the steps you’ll go through to getting hired along with the questions and challenges to expect. Let’s start by looking at the skills you’ll need to get your foot in the door. What Skills are a Prerequisite for Getting Hired by Airbnb? 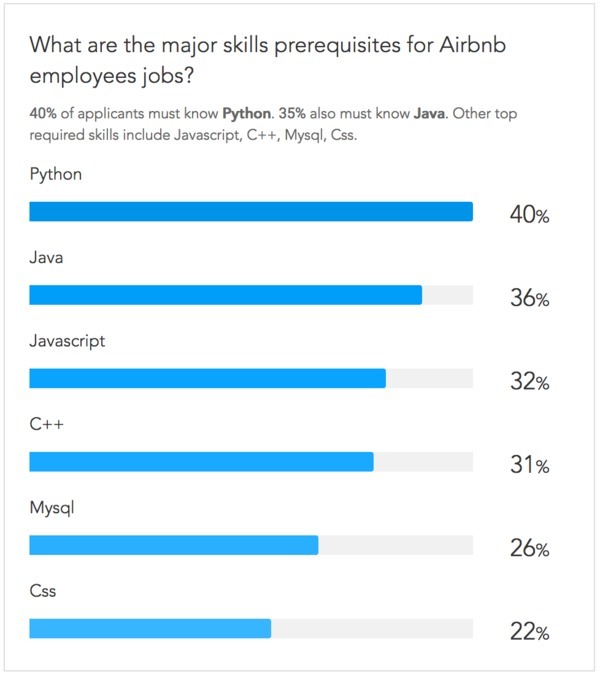 Airbnb prerequisite skills, per Paysa data. As you can see, their expectations are high. But, if you can make the cut, the rewards are pretty fantastic. In addition to the incredible perks detailed above, the average salary for a software engineer at Airbnb hovers around a whopping $255,000 per year. That’s more than Google, Facebook, and Microsoft. Not bad for a company that only launched in 2008. Average salary for a software engineer at Airbnb, per Paysa data. So, let’s say you have all the skills, and you apply for one of these Airbnb jobs. You make sure not to make any of these tech resume mistakes and are invited to interview. 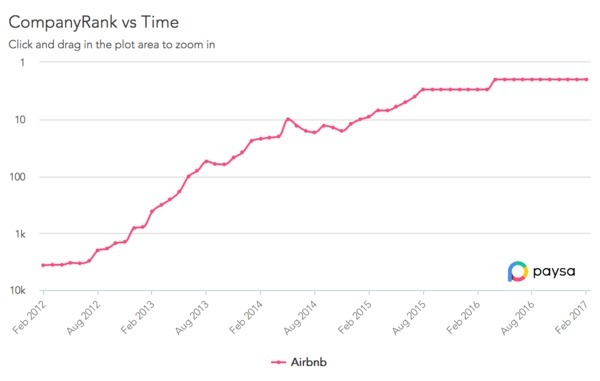 What does the process look like for Airbnb? As with most companies, candidates are selected from the applicant pool (or if your LinkedIn profile looks particularly appealing, directly contacted) by an internal recruiter at Airbnb. Depending on the recruiter’s tenure at Airbnb and general experience recruiting tech talent, your phone interview – which should last about 30 minutes maximum – may or may not have some simple coding questions to assess basic qualifications for an interview. You only get one chance to make a good impression. Remember that though this recruiter won’t be the one pulling the trigger on whether or not you get an offer, they are the only thing between you, an interview or the rejection pile. Be gracious, friendly and courteous. Respect their time and be sure to take the call from a quiet place with good reception. At the end of the day, the recruiter wants you to be the right candidate (after all, if you get hired, they can stop doing these phone screens) – give them a reason to like you, and they could become your biggest advocate and coach throughout the rest of the interview process. Explain what you do in the simplest terms possible. Find a niece, nephew, or the nearest 7th grader and practice explaining what you do in the most basic way you can. This isn’t demeaning toward your recruiter; they may be fully versed in the details of your potential future role, but they just as likely wouldn’t know the difference between Java and Python if it hit them in the head. You might be speaking to a recruiter who typically focuses on sales roles – make sure you’re checking the boxes he/she needs checked to move you forward in the process. Save the hard-hitting questions for later on in the process. You may not want to waste time going through an in-person interview for a role that eventually won’t be a fit, but your initial conversation with a recruiter isn’t the right time to be digging into financial matters. Don’t ask how much equity you might receive and whether or not they’re willing to help pay for your master’s degree. 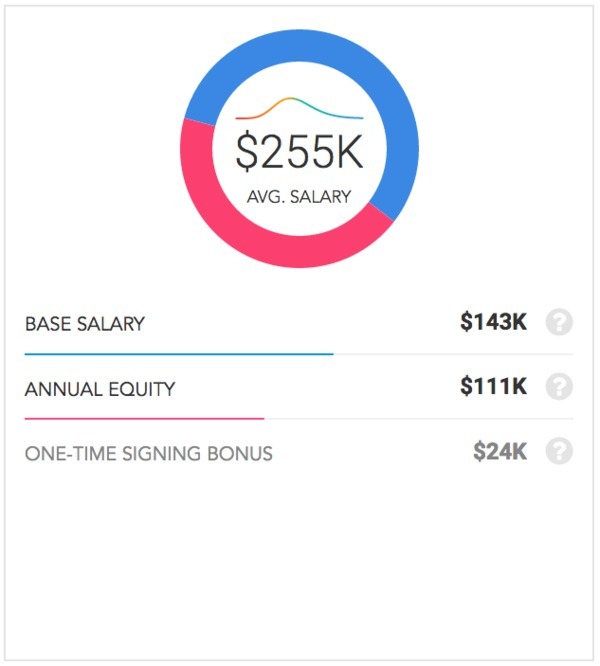 Besides, if it’s salary data you’re after, Paysa has that information for you. No need to ask what the average salary is for a Data Scientist at Airbnb. Paysa has you covered. Average salary for a data scientist at Airbnb, per Paysa data. Once you make it past the recruiter, the next step is speaking with a member of the team you might eventually be working on. While each step in the process is obviously important, this one may just carry the most weight of them all. You’ll be speaking with someone who you may eventually have to work with every day. They are likely going to be hyper-attentive to your technical skills, ability to collaborate and, frankly, whether or not you seem like a cool person to be around for 8 hours a day five days a week. In light of that, here’s the most common piece of advice across all reviews of the Airbnb interview process: culture matters above all else. Be a Host. Care for others and make them feel like they belong. Encourage others to participate to their fullest. Listen, communicate openly, and set clear expectations. Champion the Mission. Prioritize work that advances the mission and positively impacts the community. Build with the long-term in mind. Actively participate in the community and culture. Be a Cereal Entrepreneur. Be bold and apply original thinking. Imagine the ideal outcome. Be resourceful to make the outcome a reality. Embrace the Adventure. Be curious, ask for help, and demonstrate an ability to grow. Own and learn from mistakes. Bring joy and optimism to work. Familiarize yourself with each of these before your interview with a team member and be sure you can answer questions of how you picture yourself working within a culture that supports these as core tenets. And make sure you truly believe them: you might be able to fake it for an interview or two, but if you don’t subscribe to Airbnb’s core values, it’ll be pretty evident early on. Time for the grand finale. If your future teammate gives you two thumbs up, you’ll hear back from your original recruiter to coordinate a time to come in for a series of sit-down interviews with various members of the team and leadership. The good news? This is the last step! Make it through this, and you may very well be working at Airbnb very soon. Needless to say, you’ll likely be quite exhausted after a round of interviews like that. But, if you come out of the other end of it with an offer, you’ll be looking at an extremely competitive salary around $249,000. Average salary for a senior systems engineer at Airbnb, per Paysa data. Many previous interviewers – both those hired and those not – commented on how unique the Airbnb process was in one respect: their turnaround time is amazing. Whereas many tech companies take quite a while dragging their feet while interviewing other candidates and potentially preparing an offer, Airbnb typically lets candidates know within a few days whether or not they’re being welcomed aboard. Hopefully, after reviewing this guide, you feel confident that you could survive and thrive in the Airbnb interview process. Whether you’re just starting your job search or are at the offer stage, Paysa can help you launch your career with Airbnb, or anywhere else you feel passionate about joining. 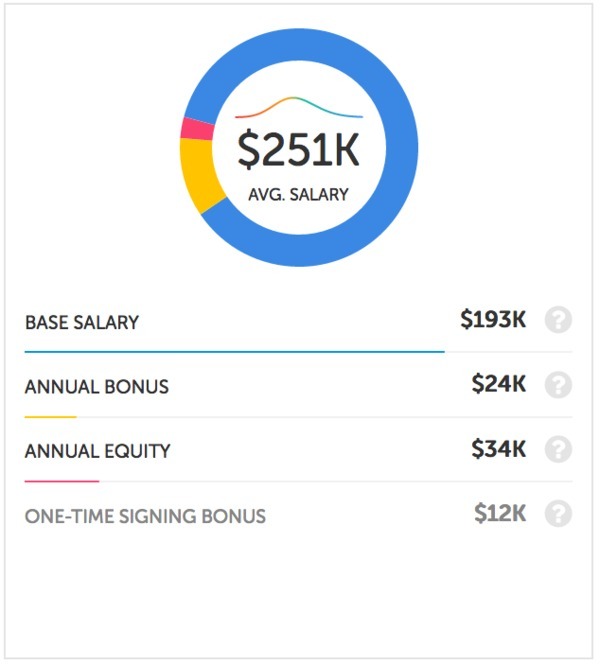 Use the Paysa job search tool to find open roles at top tech companies, then compare salary data to determine where you can receive the most value for your skill-set. And be sure to check back on the blog for more tech career information and advice.